I have had several folks ask me questions lately about how I cast my pieces for my shop, so I decided that it was time for a brief explanation and some pictures of my shop. The process that I use for the majority of my cast pieces is called Lost Wax. It all starts with waxes. 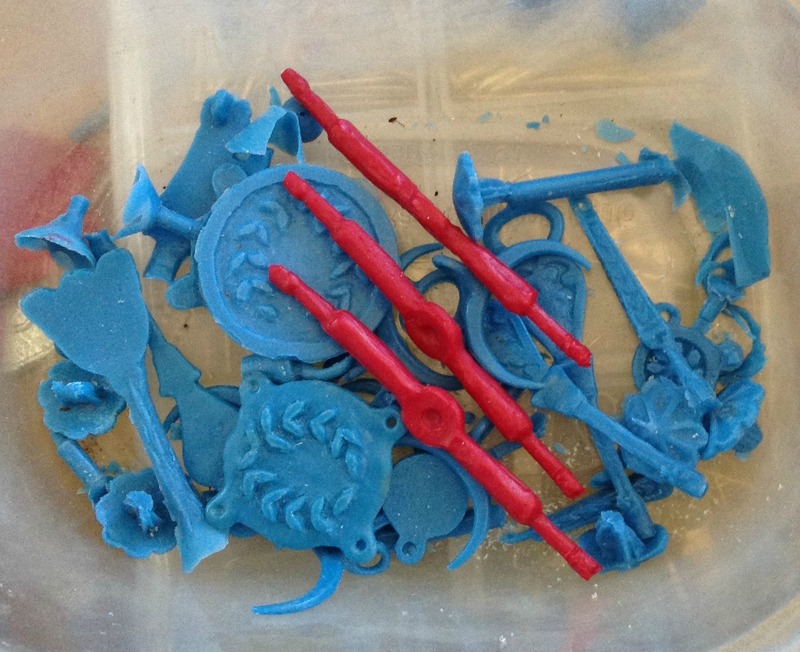 The picture below shows a few waxes that have been molded and could be turned into metal pieces. The different color waxes indicate that the wax has different characteristics. The blue wax is more brittle, but it is much better for carving. I often use this wax if I am going to repair a wax that was created from a mold of an original artifact. The details on the original may have been damaged by the ravages of time, and need some fine tuning, or there may be a broken loop or other needed repair. These waxes were created by injecting wax into an existing mold. They can also be made by carving a piece of wax to create an original master. I rarely use a wax master when I cast. Instead I make a mold of that wax and use the mold to create copies of the master. This avoids the problem of having a failed casting attempt destroy your wax master, which usually takes quite a while to create. 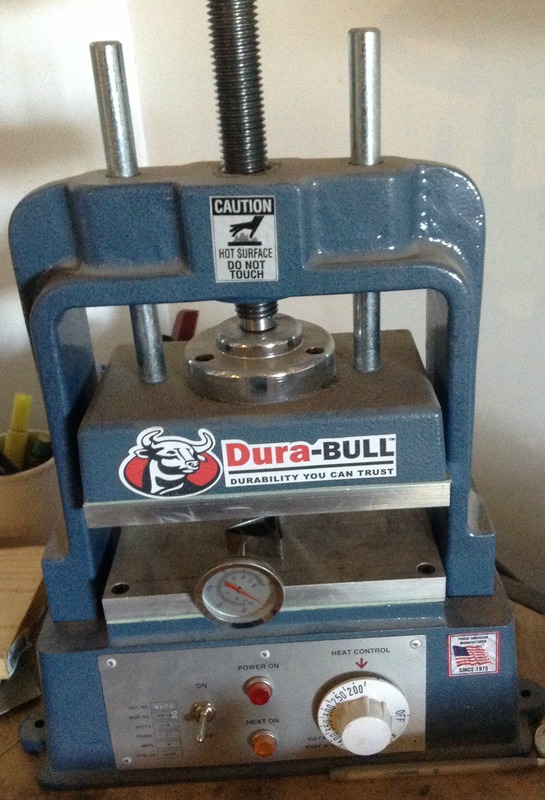 Here is a picture of the wax injector that I use for most of my wax casting. As you can tell from the drips, this wax injector contains red wax. It requires an air compressor to provide the “push” to inject the wax into the mold. The wire shelves contain an assortment of wax molds. The differences in color indicate that they are made out of different molding compounds. The green molds are made using RTV – Room Temperature Vulcanizing Silicone. That compound will harden to form a mold at most normal room temperatures. The tan molds have to be cooked in a special machine, called a Vulcanizer, in order to harden. The odd looking contraptions on the table to the left of the wax injector (with handles that look like drawer pulls) are special mold clamps that provide a reliable and steady amount of pressure on the outsides of the molds for when you want to inject them with wax. An improperly clamped mold will allow hot wax to squirt out all over. Since the wax is between 150 and 160 degrees Fahrenheit, this is both messy and a bit painful to get on your skin. This is a picture of a Vulcanizer. The mold material, with the metal model inside, is placed in a frame between two sheets of metal, and clamped between the jaws of the Vulcanizer. 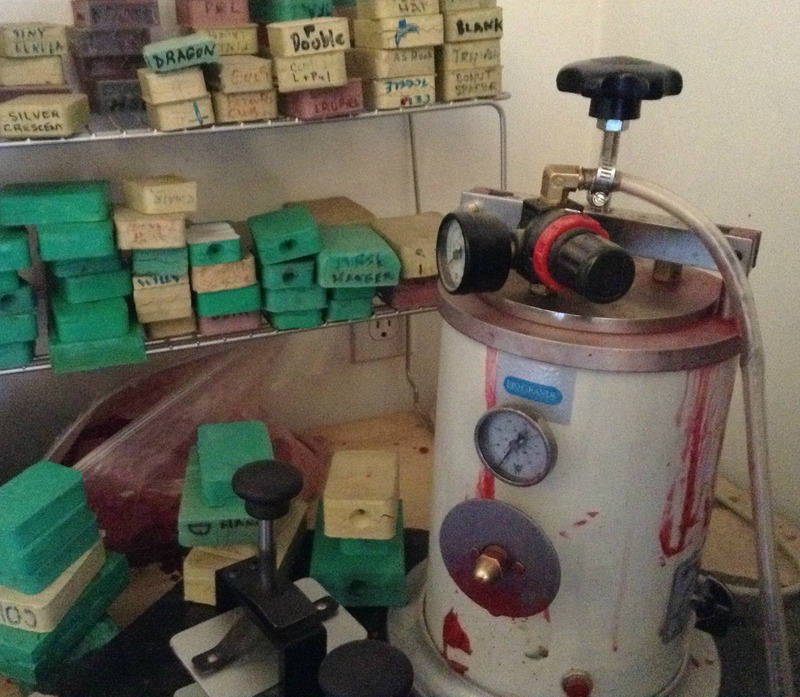 The thermometer is used to double check the exact temperature of the jaws before the mold compound is put in place. The mold is allowed to cook for between 20 minutes and several hours, depending on the thickness of the mold and the type of molding compound being used. Next Time: So now that we have waxes, what next? We turn the waxes into a mold! This entry was posted in Metal Casting, Tools and tagged casting bronze, casting metal, casting silver, Lost Wax Casting by Eirny. Bookmark the permalink.